For back cover blurb and more information about this book visit Eloise James website here. This book is filled with characters screaming for a chance at attention. First you meet Olivia Lytton, future Duchess of Canterwick. She’s been trained from birth to be the wife of a duke, and is absolutely horrible at her pre-determined position. With a fondness for naughty limericks and pursuits deemed improper, Olivia sticks out like a sore thumb. Lucky for her, she has kindness towards her fiancé; a kindness Rupert’s father believes will carry a successful arranged marriage. Then you have Olivia’s sister, Georgiana Lytton. She’s the picture perfect specimen of a duchess and Olivia’s twin. Georgiana follows all the rules of propriety, never attempting to step one toe out of line. She wants romance and a duke of her own. When the Duchess of Sconce, mother to Tarquin, the current duke, invites Georgiana to her home for a country house party Olivia is recruited to attend as a chaperone. You can guess where that leads—if you thought trouble, then you’re right. Tarquin is a man who has trouble expressing emotions. 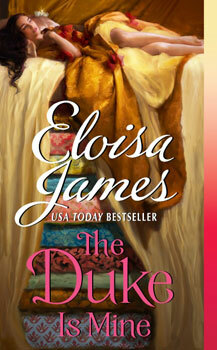 His mother believes this trait is not a flaw, but strength to his role as Duke. Tarquin is allowing his mother to choose his next bride, and Georgiana seems the lady most likely. At least until he meets Olivia. She’s plump in all the right places, and her smile brings out emotions Tarquin hasn’t experienced in years. Suddenly he’s climbing trees, and discussing things not fit for proper ears. These three along with Olivia’s fiancé Rupert, create a joyful cast that entertains from the start. Tarquin and Olivia’s scenes, and evolving romance are enchanting. The interactions draw you in, making you long for Olivia to be released from her commitment to Rupert for a chance to heal Tarquin’s emotionless state. Additionally, there is underlying conflict between the sisters, and Tarquin’s mother is another formidable opponent. The characters made this book. What made me fidgety was the end of the story. I did enjoy the dialogue and the antics of Olivia, but I couldn’t ride the wave of the setting changes toward the end. Even the princess/pea moment in my opinion was not needed. From a plot standing this story has heart and a ton of gumption. James’ creates two heroes that suffer from maladies we see in modern society, and it was refreshing to experience them in a time when no solution for them could be provided. Overall, The Duke is Mine is unique and stands apart from other historical romances I’ve read. My own personal misgivings toward the conclusion of the story shouldn’t deter readers. If you’re looking for characters that engage and provide new prospective then this is a book for you; a good reminder that romance can happen for anyone, no matter the personality. Indie Books R Us Launch Day!! !